SUMMARY: When her legs turn into a fishtail after a long day of shopping and her first menstrual cycle, Jade discovers her mother, who drowned in a boating accident years ago, was also a mermaid. REVIEW: Oh, it was okay I guess. Sixth grade girls will probably like it much better than I did. While I am sure some girls will find the overly descriptive and long-winded menstrual cycle scenes amusing, others may be embarrassed by it. 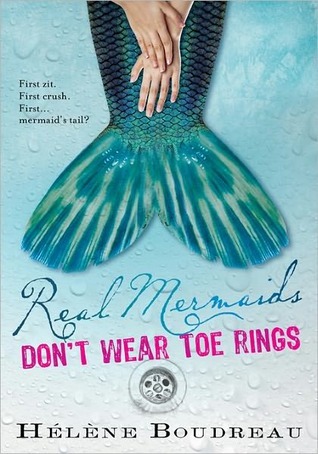 Real Mermaids is great for tween readers, but with their limited experience with menstruation, I really think it will turn off some girls. I remember reading Are You There God, It's Me, Margaret? in fourth grade, and I stopped reading it because the menstrual cycle stuff just made me uncomfortable. I just wasn't ready for all that yet. While girls in YA novels tend to talk about periods candidly with their friends (as Jade does with BFF Corrie), that wasn't something I ever really did. I'm not saying everyone will dislike it, but some will. I really liked Jade's dad and how much he loves and supports Jade, even though at times, he really has no clue what to do. Jade's crush Luke is appropriately nice and boring, but he really isn't the primary focus of the story anyway. While Jade's multiple clumsy run-ins with Luke were cute at first, I found myself rolling my eyes after the first couple of times. I know they are only fourteen, but seriously, they know very little about each other outside their clumsiness. Clearly, though I read YA almost exclusively and have loved other mermaid novels, I am not the target audience for this one. Some call it a Bridget Jones for tweens and teens, but I am just not a fan. With so many girl-mermaid novels available today, there are better choices. THE BOTTOM LINE: Meh. The best I can say is that it is okay. Try Forgive My Fins (Childs) instead. STATUS IN MY LIBRARY: We just got it.